It’s the poster for Sahara before it was ever made! That’s time travel for you. Heartbroken Guy Pearce travels in an armchair time machine to save his dead girlfriend but ends up battling Jeremy Irons and some hairy things instead. 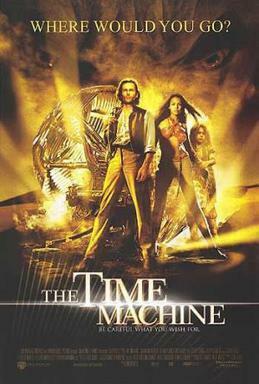 Given a façade of credibility in that it was directed by original author HG Wells‘ great-grandson, Simon, this latest version of The Time Machine is not as good as the average enough 1960 version directed by George Pal. (There’s a 1978 made-for-TV version too.) The 1960 version starring Rod Taylor fares better since it feels and looks from another time – it’s a 50-year-old depiction of Victorian England – while this version with CGI and high production values renders a fine looking 1899 New York but seems out of place. The film has a modern day gloss but does not feel ground-breaking or different in anyway. George Pal‘s 1960 version at least upped the ante in terms of effects when first released. Wells’s offering, by comparison, just feels dull. Dull as Dr. Alexander Hartdegen, portrayed by Guy Pearce. He’s fine, it’s just his character that bores. The murder of his fiancée prompts him to construct a time machine, go back to the past to try and save her and blah-de-blah-de-blah you don’t need me to tell you anymore. But I will, and the catch is the time paradox, meaning that since he created the machine out of grief for his lost love, each time he saves her, she then has to die in some other way for the machine to exist. He jumps forward to 2037 to try and find an answer but encounters Earth on the brink of collapse. Escaping this turmoil, he accidentally jumps forward again, this time to the year 802701 where he finds the world overrun with Starbucks, I mean Morlocks. These human-descended furry beasts feed on human-descended non-furry beasts, the Eloi. Just to be sure of the difference, Morlocks look like pumped-up, saucer-eyed bewigged versions of a post-plastic surgery Cher, while the peaceful Eloi come in the shapely, scantily-clad form of Samantha Mumba. Hartdegen falls for Mumba, who – guess what? 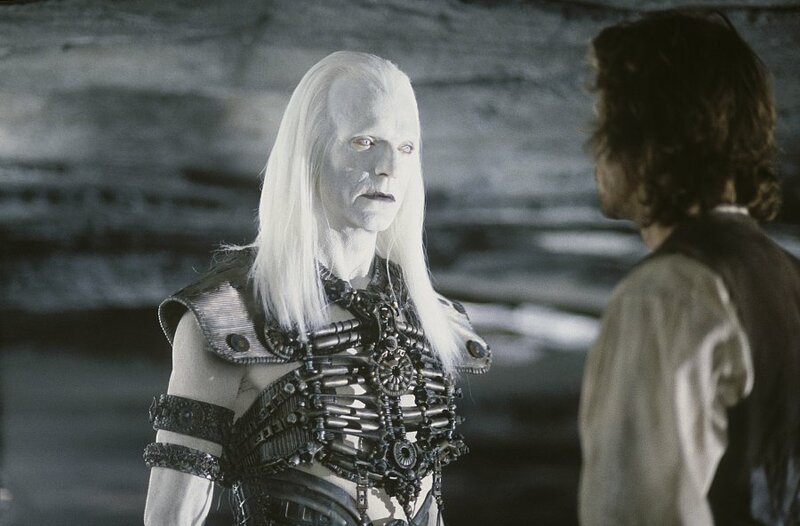 – makes it onto the Morlocks’s menu while Morlock boss Jeremy Irons explains the terrible truth of the feeding regime. Hartdegen faces-off with Irons’s Über Morlock in the Time Machine, eventually kicking him out of the device where he totally unsurprisingly shrivels old quickly, before the Machine grinds to a halt in the year 635,427,810. And let me tell you, there’s not much to see there. You see, it’s dull, again, which is such a let down. A wasted opportunity. The Time Machine tries hard, and it really wants to be better than it is. But here’s a tip (stupid sign-off sentence approaching): turn back the clock and dig out the 1960 version. Or better still, watch Back to the Future again.